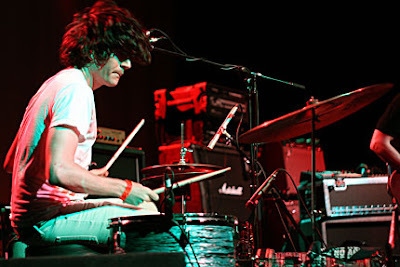 This is a photo of me playing drums at the fonda theatre where we opened for battles. i found it on the spin.com website. it was a fun show. kids didn't want to move, but that is okay, they can relax if they want to while we sweat and jump around like the joyful old men that we are. we also played in SF with them at the great american music hall. great place to play. it was sold out and they made randy and i this really great vegan thai noodle dish, while everyone else had chicken and waffles. if you went, thanks for being radical.